Featuring miles of stunning Maine coast, Acadia National Park gets over two million visitors each year and is one of America’s most visited national parks. The park is located near Bar Harbor, Maine and reserves much of Mount Desert Island, and associated smaller islands, off the Atlantic coast. 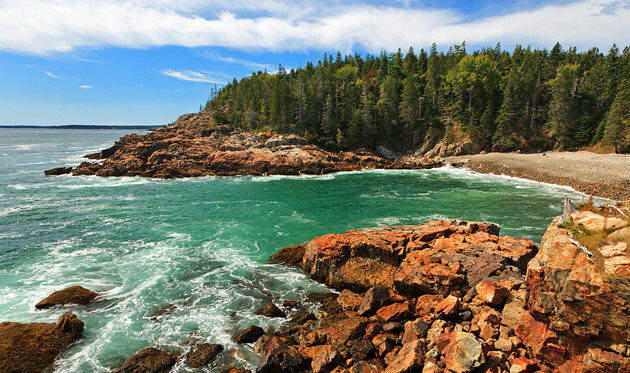 Acadia National Park features granite cliffs side by side with sand and cobblestone beaches. Glacier-carved mountains rise from the sea, cupping deep lakes in their valleys. Throughout the park, the ocean makes its presence known, whether by sight, sound, or smell. Acadia is famous for Cadillac Mountain — and it is possible to run up it. Its lichen-covered, pink granite summit is, because of a combination of its eastern location and height, one of the first places in the United States to see the sunrise. Acadia’s weather is largely a product of latitude and marine influences. Spring can be foggy with temperatures ranging between 30 and 70 degrees. Summer daytime highs average in the 70s, and it can get chilly at night. Fall brings temperatures ranging from low 70s during the day to freezing at the night. Fall foliage often peaks during the first couple of weeks in October. During winter, due to Acadia’s coastal location, snow and weather conditions change rapidly. Temperatures vary from mid-30s to below zero. The park averages 61 inches of snow annually, lower than some inland areas at the same latitude due to the ocean influence. Our three major running recommendations for Acadia are the Carriage Road trails; the park perimeter road; and the challenging run up Cadillac Mountain. The Carriage Rode trails, in particular, are unique and a running highlight. For trail runners, there are some gentler hikes that can be done as runs. Acadia National Park’s Carriage Roads are among some of the loveliest and most run-friendly options of all the National Parks. These 45 miles of rustic carriage roads are the gift of philanthropist John D. Rockefeller Jr. and family, weaving around the mountains and valleys of the park. Rockefeller, a skilled horseman, wanted to travel on motor-free byways via horse and carriage into the heart of Mount Desert Island. His construction efforts from 1913 to 1940 resulted in roads with sweeping vistas and close-up views of the landscape. The carriage roads have crushed rock surfaces and wind through the heart of the park. They have been lovingly maintained. The roads are mainly wide, wooded trails, relatively flat, some with fantastic views to the water. These trails are especially gorgeous in autumn! And in winter, if there’s 6″ or more of snow, the trails are groomed by a group of volunteers! They are wide enough for runners and winter sports lovers to share the trail. Grooming/snow status here. A few particularly recommended carriage road options are in the map and guide below. A favorite is the 3.3 mile loop around Witch Hole Pond. 27 miles all the way around. Park Loop Road MAP. It is possible to run along the 27 mile (43km) Park Loop Road at Acadia. There is a shoulder in parts, but not all. The eastern section of the loop road from just north of Cadillac Mountain to near Jordan Pond is one-way. The road south of Sand Beach features some of the best views. One can run along any section of the road. The most spectacular section with the best views is south of Seal Beach to Little Hunters Beach, which is 4.7 miles one way, featuring 220 feet of elevation gain. There is a path along the ocean for some of this section. One option for runners is to run one way along a section of the road and use the Park Shuttle to get back to starting point. Note: the park loop road is closed in winter. Cadillac Mountain is the highest point along the North Atlantic seaboard, and it is the first place in the United States to see the sunrise from October 7 to March 6. Running up Cadillac Mountain is a great running challenge. There is a paved road, accessible to cars, that rises from the Park Loop Road to the Cadillac Mountain summit. It is 3.3 miles one-way to the summit, with an elevation gain of some 1,000 feet with grades of 5–7% most of the way. There are some great observation points just off the road along the way, providing a good opportunity for a rest!